People don’t like hearing no, especially to their own ideas. It’s a rejection and it can make people feel stupid. It only takes a moment to rephrase that no in a more positive way. By adding a new potential solution to the problem you haven’t shot down their idea. Instead you are offering an alternative way to achieve the same goal. Use the shared goal as your common ground. By saying No less often you will be a more constructive problem solver. People are naturally drawn to optimists, especially as leaders. 27 Powers of Persuasion: Simple Strategies to Seduce Audiences & Win Allies by Chris St. Hilaire with Lynette Padwa provides useful ideas for being more persuasive when communicating with people around you. This book offers a collection of positive and non-manipulative techniques to make those around you feel better about themselves, and about you. Leaning over someone, using five minutes to make your audience feel safe and staying in the present were just a few of the many, though often obvious, suggestions of persuasion given by Chris St. Hilaire in his book, “27 Powers of Persuasion,” which has recently been released in paperback. It’s quite amazing to consider the many ways in which one can break down the methods of persuasion. For those who might think that a businessman, lawyer, politician, or reporter can simply walk into a room and cause everyone to agree with his or her points of thinking, St. Hilaire would argue otherwise. Some readers may read a chapter in the book — each of which focuses on a particular method of persuasion — from the tactics mentioned above to using third-party validation and being your own pundit. Oft times, the suggestions seem of common sense, though others may not strike readers as such. St. Hilaire also uses appealing personal examples, including, among other examples, the time he wore a pink shirt as a part of helping a team of lawyers recognize their reality. In doing so, St. Hilaire has appealed to readership beyond just law or journalism, but to business owners and even parents striving to guide a family. St. Hilaire’s appeal to a wide demographic through his strength of parallels is found from start to finish. One critical characteristic in any business leader’s success, especially a CEO’s, is their ability to be persuasive. Among the best is their ability to persuade, to get thousands marching in the same direction, it all looks effortless. But we all know it’s not. I’ve watched some of the best CEOs in America in action. I’ve sat with them, talked with them, picked their brains. I’ve watched them lead meetings and solicit opinions and each share common attributes. I’ve watched some lousy CEOs in action too. There tends to be similarities in their styles as well, but let’s focus on the positive. Whenever you’re trying to persuade, your first mission is to define the goal. The most effective way to do this is not to announce the goal to the group, but to help everyone decide on it together. You want to have the largest possible buy-in from everyone involved, and you get it by having everyone contribute to the goal at the beginning. A good way to get the ball rolling is to simply ask the room, “What’s our goal? What are we trying to accomplish today?” Let people talk. Let them give you the answer. If no one speaks up, directly ask them for input. Boil it down to one or two simple sentences that everyone agrees on, even if it seems obvious. There is great power in stating the obvious. No one wants to do it because it seems so rudimentary, but the minute you state the “obvious” goal of a meeting, you become the leader even if you’re not officially in charge. This is because every group has an innate longing to be unified. Confusion and discord make people feel anxious and threatened, and unity makes them feel safe. People unify around a goal. Want people to be more enthusiastic about your plan? Make it their idea. Create situations that will encourage the others to speak up, pro or con. Give people choices in which you’re comfortable with either choice. Use their points to support your goal and tie points together using other people’s suggestions. Making everyone in the room right, will unify them around your goal. It’s a win/win for everyone. People love to quantify things, even when what we’re stating is an opinion. For some reason it makes points more official. Using a statistic or two (don’t over stat them) creates some official barometer in which to measure success. It also creates the impression that there’s some official measurement involved. You used to see it a lot in commercials where 9 out of 10 dentists surveyed prefer one tooth-paste over another. Silence and being comfortable with it allows you to take control of a room without seeming aggressive. Try it. Sit silently, comfortably – one of two things will happen. First, if your listener is nervous they’ll add on and you’ll get to what they really think. Second, some of the best solutions to problems come at the end of a statement, after they “seem” finished. Use silence to your advantage. It’s a concept that has long been familiar to people in advertising. For them, the gold standard of owning the language has always been when the product name replaces the actual noun or verb. Classic examples are Kleenex for tissue, Chapstick for lip balm and Fedex for overnight delivery. Your ability to invent terms, to define the language, means that everyone will adopt your thinking. Just about every aspect of our life involves persuasion. Those who master it are reaping the benefits. I hope you’re one of them. 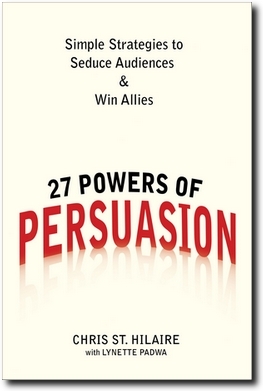 To read an excerpt of “27 POWERS OF PERSUASION: Simple Strategies To Seduce Audiences & Win Allies” click here. About the author: Chris St. Hilaire is founder and CEO of three companies: Jury Impact, M4 Strategies, and Quantitative Focus. 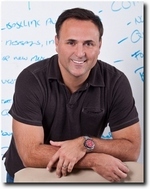 As an award-winning message consultant for some of the most high-profile cases in America, he has advised partners at Latham and Watkins as well as senior counsels for Hospital Corporation of America, Great American Insurance Corporation, Lucent Technologies, AT&T, Mitsui-Sumitomo, Goodyear-Dunlop Tire Company and numerous other national and international corporations. St. Hilaire has served as political director in California state government, and as chief strategist and message specialist for many of the nation’s largest political campaigns. Most people think “ego” is the same thing as self-regard, but the Buddhist concept of ego is different. It’s more fluid. Buddhists believe that inside each of us is a constant struggle between the ego that says, “I’m different. I’m special,” and the spirit that knows we’re all the same. The ego wants to separate from others. The spirit wants to unite. When you’re trying to persuade, coming from the spirit-from a place of unity and inclusion-is the most effective approach. The key to successful persuasion is to put your own ego aside and focus on making others in the room feel safe and included. You’re not trying to talk them into your plan, you’re trying to make it their plan too. From the very beginning you ask them, “What are we trying to accomplish here?” You let them define the goal with you. With their input, you boil that goal down to one or two simple sentences that everyone agrees on. Then you state it out loud, and you’re the leader of a group of people who have unified around the plan. When everyone feels invested, their commitment to the goal will be strong and long-lasting. That’s true persuasion, based on Buddhist ideals of unity and inclusion. Jurors are typically instructed not to include attorney fees when considering damage awards. Think they’re listening? Nationwide data collected this year from our jury focus groups is telling: A whopping 76 percent say they would take lawyers’ fees into account when determining damage awards. As you can imagine, this “juror math” can cause large verdicts to quickly grow larger. Give us a call if you would like to know more about our research in this area. And don’t forget to pre-order Chris St. Hilaire’s new book 27 Powers of Persuasion available online now at major book retailers.